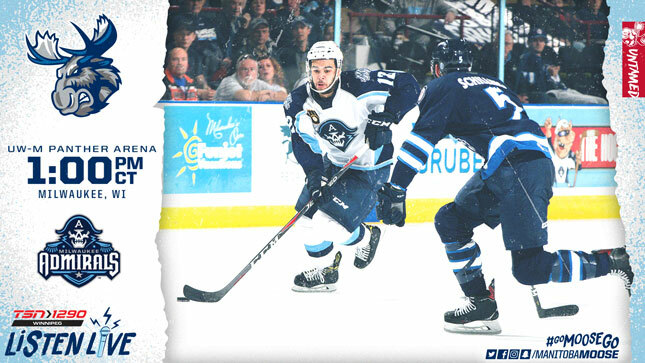 The Manitoba Moose (19-18-3-2) finish off their road swing today in Milwaukee, where they take on the Admirals. (21-17-6-1). The action gets going at 1 p.m. CT on TSN 1290, moosehockey.com/listenlive/, the Moose App, and streaming live on AHLTV. The Moose will want to get the taste of last night’s shootout loss in Rockford out of their mouths, so a game starting less that 18 hours later could be a huge benefit to the club. Seth Griffith enters today’s action riding an eight-game point streak. With two assists last night, Griffith not only marked his 10th and 11th assists of the streak, but recorded his sixth multi-point game of the season. Over the eight appearances, the Wallaceburg, Ont. native has 12 points (1G, 11A). The lone goal came when Griffith ended a game against these same Admirals less than two weeks ago, in overtime, on Jan. 14. The Moose have won three of their last four meetings with Milwaukee this season. That includes splitting previous visits to UW-M Panther Arena earlier this season, thanks to an OT winner from Mason Appleton. Griffith isn’t the only Moose player riding a hot streak, as Sami Niku extended point parade to five (1G, 4A) over his last four AHL appearances. Meanwhile, Eric Comrie extended his run of games in which he’s face more than 30 shots. If Manitoba’s netminder hits that threshold once again today, it’ll be the 13th game in a row with Comrie taking that much fire. 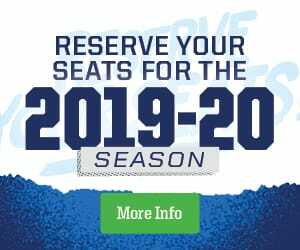 The run started with a 38-save shutout of the Colorado Eagles on Dec. 30, and Comrie has maintained a 0.944 save percentage over the 12 starts. Players to watch in today’s battle are Emil Pettersson and Nicholas Baptiste for Milwaukee, who have combined for seven points (4G, 3A) in the four games against the Moose. For Manitoba, it’s Griffith and Logan Shaw who have been the Admirals’ achilles heel. Shaw is headed to the 2019 Lexus AHL All-Star Classic tomorrow while the rest of the squad takes some time off. The break doesn’t last long as another three-game road trip begins on Feb. 1 in a rematch with the Admirals.